Here's what they're saying about Puzzazz. There are lots of puzzle apps, but without a doubt, Puzzazz is the puzzle section of the App Store. Its digital shelves are not just stocked with crosswords, but with puzzles that other app makers would dare not attempt. Books are filled with the likes of cryptic crosswords, puzzle short stories, logic squares, there’s even a puzzle hunt. 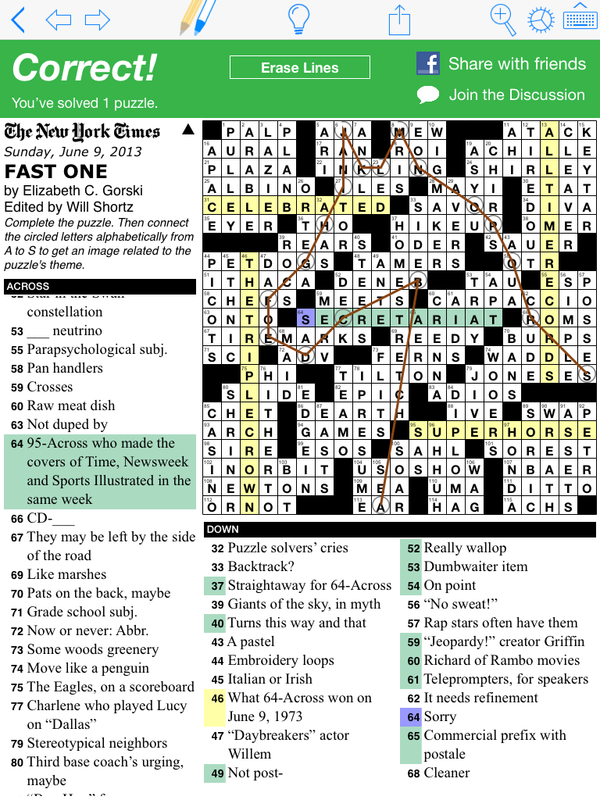 Even if you’re not a New York Times crossword subscriber, you should check it out. These days, many newspapers and magazines are offering online versions. Many puzzle solvers might wonder what will become of the crosswords and other challenges featured in many of these publications. Will the solving experience translate to an online format as well as reading does? The people at Puzzazz, including founder Roy Leban, certainly think so, and since 2008 have been working hard on cultivating quality puzzles and developing TouchWrite, a groundbreaking new technology for doing puzzles on the screen. Puzzazz, a puzzle tech company captained by Roy Leban, has announced the release of a nifty puzzle e-bookstore for the iPhone and iPad that features TouchWrite software, a handwriting recognition system. The interface looks snazzy, and you can download books galore by some of your favorite constructors. Puzzazz, a Seattle-area puzzle technology startup, is making the leap to iPhone and iPad with a new app for trying, buying and solving digital puzzle books on Apple iOS devices. The app includes unique handwriting recognition technology, developed by Puzzazz, that lets users enter characters into a puzzle by writing on the screen with a finger.... The handwriting recognition works well on the iPad, but it will end up being most useful on the smaller screens of the iPhone and iPod touch, letting users hide the keyboard and see a larger view of the puzzle as a result. TouchWrite also could come in handy on a smaller iPad, if Apple comes out with that rumored device. The puzzle interface is user-friendly and the TouchWrite feature overcomes many of the drawbacks inherent in dealing with a relatively large grid on a small screen. In my view, the TouchWrite technology is a game changer when it comes to solving puzzles in general and crosswords in particular on mobile devices. The keyboard not only takes up a lot of valuable real estate but on the small screen of an iPhone or iPod it can also be cumbersome to type accurately and not exactly user-friendly if you do mistype something. Very cool! ...this app is a sure fire way to beat boredom while stimulating the brain (seriously, give Angry Birds a rest already). A small Redmond company is betting that puzzle aficionados will pay for good digital puzzles delivered on a platform that's easy and natural to use. Redmond-based Puzzazz has launched a puzzle book platform, available via mobile apps, where puzzle enthusiasts can browse different authors and designs, try out puzzles and buy an entire book of them for a few dollars. Puzzle technology startup Puzzazz is giving Amazon's Kindle Touch a capability that even Amazon didn't envision -- letting users input numbers and letters by writing them naturally with a finger on the screen, rather than tapping at the e-reader's tiny on-screen keyboard. Unlike some handwriting-recognition from years past, the TouchWrite technology doesn't require users to learn any special way of writing, and it recognizes many different styles of writing different numbers and letters. It's the latest effort by the Seattle-area startup to improve the experience of using e-books, through its lineup of digital puzzle books. Redmond startup Puzzazz added some pizzazz to its latest puzzle game for Amazon's Kindle. The company developed a handwriting recognition system that founder Roy Leban calls the first such system to appear on a Kindle. ... So is this the turning point for the 3-year-old, four-person startup? "Maybe," Leban said. "It is the most exciting product launch we've had." Puzzazz, a puzzle technology startup, has launched the first handwriting recognition for any ebook reader... A game changer for Amazon's Kindle Touch, Puzzazz's exclusive TouchWrite technology allows puzzle lovers to solve puzzles by writing directly on the page of an ebook. [Puzzazz] has established a new core technology that might end up being a bigger draw than their Sudoku apps. They call it TouchWrite, and it lets you draw letters and numbers directly on the screen instead of tapping them on the on-screen keyboard. A modest achievement in some ways -- basic handwriting recognition goes back decades -- but the fact is that the ability to draw a B or 7 right on the screen is handy, and more natural to puzzle-doers than the alternative. But more importantly, it's a fundamental method of interaction that none of the touchscreen e-readers have implemented, and Puzzazz is in a position to make their solution the official one. Amazon's Kindle Touch is getting handwriting recognition, but it isn't being delivered by the company you think... Developing interactive e-books is a key battleground for both big and small companies. Puzzazz and TouchWrite stand at one side of the spectrum, while Apple looms at the other. [W]ith the introduction of TouchWrite, it seems that Kindle Touch finally has something awesome to boast about. Puzzazz: Who Needs a Stylus? Got a Kindle Touch? If so, you’ll want to check out what Seattle-based startup Puzzazz has just come up with... TouchWrite allows you to write directly on your screen (both letters and numbers) with your finger... That puts Puzzazz ahead (way ahead) of the pack. Puzzazz clearly had other ideas -- that the Kindle could be put to use for more entertaining stuff rather than just reading e-books... Interactive e-books are what the future of digital books will be like and the new handwriting recognition technology from Puzzazz has already made a start on this. It will be interesting to see how what the future has in store on this. [T]his is the first time any company has found a way to use [handwriting recognition] technology on devices like Amazon's Kindle Touch. Beyond Sudoku puzzles, anyone that likes to complete crossword puzzles could also use this type of technology. When Amazon announced the latest generation of Kindle it included a touchscreen option in the form of the Kindle Touch, which allowed the entire unit to be smaller due to the removal of the keyboard. Beyond simple input and navigation, the touchscreen isn't used for anything else, that is, until Puzzazz started experimenting with it... [Y]ou can simply write the numbers on the screen and they instantly get converted to fill a square with the digital equivalent. Redmond-based startup Puzzazz is bringing handwriting recognition to Amazon's Kindle Touch device. The company's TouchWrite technology recognizes handwriting and converts it into numbers and letters on the Kindle... The technology is a first of its kind for the Kindle, which has limited memory and processor capabilities... Although you won't be able to create the next great novel with the technology, Puzzazz believes this is the future of digital puzzle books. The Kindle Touch just got a new functionality -- handwriting recognition... Sudoku Unbound #3 for the Kindle Touch introduces TouchWrite technology for the device that allows users to write with their fingers... This is the first time the technology has appeared on the Kindle Touch. If you thought the Kindle Touch was limited to page-turn taps and a pokey on-screen keyboard, it's time to re-evaluate. A start-up is now demonstrating software that lets the eReader handle handwriting recognition. Puzzle-game startup Puzzazz is demonstrating software that lets users fill in text boxes by writing naturally on the screen with their finger, as opposed to tapping at a tiny on-screen keyboard. Seeing it in action in the video, it seems to work surprisingly well -- it certainly seems to recognize numbers without too much trouble. Puzzazz is a puzzle technology company whose latest trick is to teach your Kindle to recognize your handwriting... Users are able to "write" by tracing a finger over the surface of a Kindle Touch. The e-book, not the Kindle itself, will recognize the motions and fill in the corresponding letter or number. It may have taken 3 months, but the Kindle Touch finally has an app that really makes use of the touchscreen. Puzzazz, a developer who has been working on Kindle active content since the very beginning, has just unveiled their newest app for the Kindle Touch... It's a variation on the many Sudoku games available for the Kindle, only this one has a little something extra. You can now write the numbers instead of typing them in. Sudoku is not my game, but the tech is so very cool. While app-games like Angry Birds are more puzzle-like than you'd imagine, one author says some of our favorite mind-bending activities are based on games from the past. A group of startups met up this week in Redmond for the first Ebook Innovation Summit, a small gathering of companies involved in different aspects of the electronic book business -- spending the day demonstrating their latest projects and talking about their common challenges. The summit highlighted the emergence of an innovative segment of the startup community, rising up in the shadow of Amazon.com, and working on ebook technologies for a variety of platforms. Chip Brown, our latest Geek of the Week, spends his days immersed in puzzles and technology as the chief architect for Puzzazz, the Seattle-area startup known for products including puzzle e-books for Kindle. But his personal life is just as interesting, with hobbies ranging from beekeeping to a playing a challenging variation of Scrabble known as "Clabbers." Puzzazz Gets First Financing Round With strong leadership and drive, Puzzazz may have just started on a climb towards puzzle prominence. Puzzaz makes electronic puzzle books, including variations of Sodoku, that can be solved on the digital page -- much like paper puzzle books but with the advantage of being able to ask for hints, have the book remove mistakes, or change the level of difficulty, among other features. [W]orking to the company's advantage is a strong position in a unique niche. Hundreds of traditional paper puzzle books are available in the U.S. every year. But "right now there are a grand total of three on Kindle, and they're all from us," Leban said. Roy Leban of Redmond-based Puzzazz sees profit potential in reaching those who can't start the day without a puzzle. A Seattle startup company [is] using emerging technology to improve the experience of solving puzzles... Puzzazz is pioneering the publication of puzzle books for devices like the Amazon Kindle. E-books offer numerous advantages over traditional books: electronic puzzles can be wiped clean and re-solved where paper puzzles can't; built-in tools can enrich the solving experience for logic puzzles like sudoku; hinting and error correction are more fluid; solvers don't have to draw the unusual symbols that some puzzles require; and the books themselves are more portable. To fully grasp the significance of what Seattle startup Puzzazz is doing with Amazon.com's Kindle, it's important to first set aside the notion that it's making electronic puzzle games. It's not. There are no timers or glitzy animations or worldwide leaderboards. In reality, these are books. They just happen to be digital. And they also happen to be better, in many ways, than paper puzzle books. [Puzzazz] has built Wordoku, a spin on Sudoku, that uses letters instead of numbers, and acts just like puzzle books found in airports, drugstores and bookstores. While it's easy to dismiss the release as just another game for the Kindle, Roy Leban, CTO and founder of Puzzazz, sees it as much more and has ambitions to change the kind of applications that are built for the Kindle. As a true puzzle enthusiast, who's been published in the New York Times and has been a part of eight previous tech start-ups, Leban is easygoing and entertaining. He claims he can breathe new life into the Kindle games. [Other titles] are all repositioned games from other platforms. [Puzzazz's title] works in the same way as other puzzle books. You can start one puzzle and not finish it. Then move on to the next page and come back later to take a stab at the first one again. Users can change the difficulty after buying the book that fits their needs; otherwise, the puzzles get slightly more difficult as you work your way through the 100-page book. Technology entrepreneur and user-experience specialist Roy Leban, a fixture in Seattle's tech community, is taking steps to turn his Puzzazz puzzle site into a full-fledged startup -- building a team, pursuing funding and developing content for devices including mobile phones and Amazon's Kindle. Attention, word nerds! What's a seven-letter word for the answer to your bottomless puzzle-craving needs? Puzzazz (puzzazz.com). Put down that Scrabble dictionary -- it's not in there (not yet). Puzzazz -- a portmanteau of "puzzle" and "pizzazz" -- is a Web site created by puzzle master and Redmond resident Roy Leban. A software developer by day, Leban created Puzzazz last fall to benefit anyone for whom daily newspaper crosswords simply aren't enough. The site serves up a puzzle a day which you can solve solo or in online competition with other nerds and dear friends. Take that, Will Shortz! When the Sunday paper arrives, do you break out in hives, eagerly anticipating a bout of sudoku and crossword puzzles? If so, then you'll really enjoy a new creation called Puzzazz -- what does it do? In a nutshell, it gives puzzle people daily puzzles -- think of it as a fun and puzzling daily diversion!. I'm Addicted! I've been doing Puzzazz puzzles most every day since it was launched last fall. Each day is a fun five minute challenge. I also like Roy's daily recommendations for books related to games and puzzles. Roy Leban's Puzzazz website gives me something to look forward to every morning. I highly recommend it to anyone who hasn't yet discovered it. I managed to get my daughter hooked on Puzzazz, too, so whichever one of us gets it first gets to gloat. Love the puzzles. They are one of the first things I do in the morning. Great way to wake up. Puzzazz has a quick, fun word puzzle every day, perfect for fans of Scrabble and other word games. If you want some food for thought every day along with your breakfast, check out Puzzazz. I love this site! I am a college senior and I have never been so busy in my life, which unfortunately has resulted in the decay of my daily crossword habit. So Puzzazz is exactly what I need right now: a daily diversion that I always have time for. Thanks for identifying a need and serving it so well. Thanks so much for running the site! It's a blast, and one of the highlights of my day. Some names may be trademarks of their respective holders.